While achieving volume in your hair can be pretty easy for any hair type, I think that actually maintaining it is super difficult regardless of whether your hair is super, super thick like mine (which causes it to just weigh itself down) or very thin and flyaway (which means it doesn’t actually have enough weight to hold itself!). Backcombing is the obvious go-to, but personally I absolutely HATE backcombing my hair simply because there is SO much of it that brushing it out takes about five million years and a high threshold for pain. In a bid to help my excessive mane achieve a bit of body, I’ve been trying out two different volumising hair powders from the high street and the high end. In the red corner, we have Trevor Sorbie Volume Big Hair Powder* and, in the blue corner, Bumble and bumble Pret-a-Powder*. 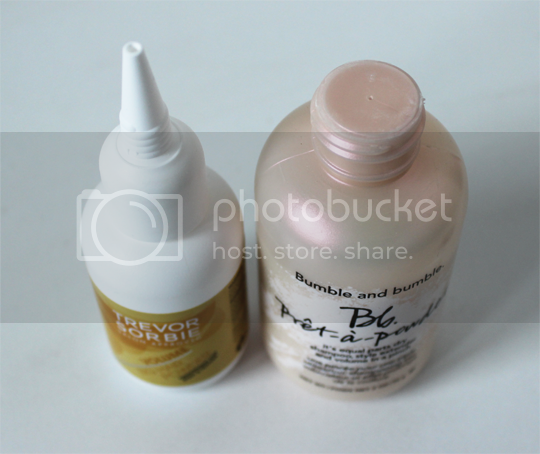 Purely in terms of aesthetics, the Bumble Pret-a-Powder is way prettier thanks to its shiny mother-of-pearl finish. But what really counts is how practical the packaging is, and I have to say that the nozzle style of the Trevor Sorbie bottle makes application that bit easier as you can get right into your roots with no effort required. One point to Trev. Both powders work in essentially the same way, but there are little differences. With the Volume Big Hair Powder, you can actually see the particles expanding when you puff a bit out of the bottle whereas the Pret-a-Powder comes across as more of a straight talc-like texture that doesn’t react with the air. In the hair, they both achieve some serious root lift – just squeeze the bottle to puff a bit of powder into the roots all over the head, give your scalp a quick ‘zshoozsh’ (as if you were massaging in shampoo) et voila, your hair instantly has body and volume. Pret-a-Powder is also marketed as a dry shampoo, although I don’t find it nearly as effective as something like Batiste for this purpose. With both powders, my stupid heavy hair will start to weigh itself down and fall flat after about 6 hours but a quick re-zshoozh activates the product again so no complaints and no particular winner on this one. A dead heat. Ahh, the big one. Now, this is quite surprising and has gone totally the opposite way to what you would first assume. 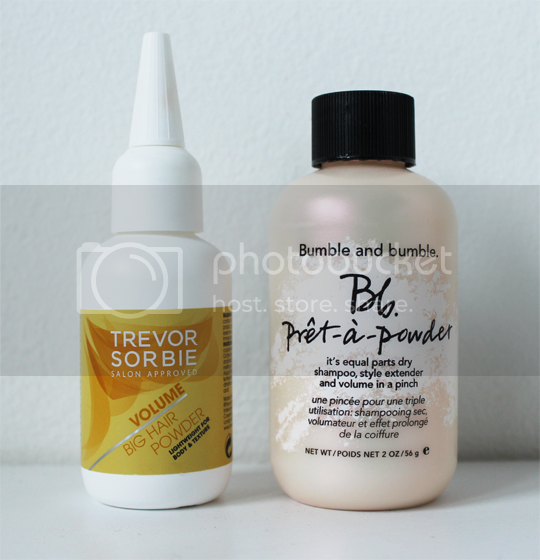 If you had both of these in front of you and picked them up, the first thing you’d notice is that Bumble’s Pret-a-powder is pretty weighty but Trev’s Volume Big Hair is an anti-gravity style next-to-nothing kinda weight. Now, when I tell you that the Trevor Sorbie costs £6.29 for 5g, and Bumble & bumble costs £21.50 for 56g, that’s pretty unexpected, huh? That means, for the same amount of product as you get with Bumble, the Trevor Sorbie product would cost a MASSIVE £70.44 making it over three times more expensive gram-for-gram. Considering that you need about the same amount of product with each one, it’s nil point to Trevor a big win for Bumble. While Trevor Sorbie Volume Big Hair Powder does work out way more expensive in the long run, if you’re just looking to try a hair powder and aren’t sure they’re going to be for you this is a good place to start because it’s a small amount of product at a fairly small price. It’s available from Boots, if you want to pick it up. I think the overall winner has to be Bumble & bumble Pret-a-Powder because it works out at much, much better value for money and well, I am very fond of the packaging. You’ll have to wait a little longer to get your hands on it though, as it’s not released until 27th January 2014. When it finally does launch, you’ll find it at Space NK, John Lewis, Selfridges, Liberty and select Boots stores which carry the Bumble range. Have you tried any other volumising hair powders that I should be checking out?